In 2010, President Barack Obama signed a law repealing one of the most controversial policies in American criminal justice history: the one hundred to one sentencing disparity between crack cocaine and powder whereby someone convicted of "e;simply"e; possessing five grams of crack-the equivalent of a few sugar packets-had been required by law to serve no less than five years in prison. 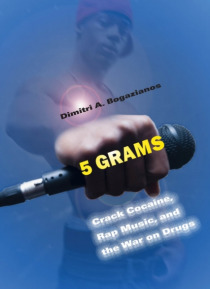 In … this highly original work, Dimitri A. Bogazianos draws on various sources to examine the profound symbolic consequences of America's reliance on this punishment structure, tracing the rich cultural linkages between America's War on Drugs, and the creative contributions of those directly affected by its destructive effects.Focusing primarily on lyrics that emerged in 1990s New York rap, which critiqued the music industry for being corrupt, unjust, and criminal, Bogazianos shows how many rappers began drawing parallels between the "e;rap game"e; and the "e;crack game. "e; He argues that the symbolism of crack in rap's stance towards its own commercialization represents a moral debate that is far bigger than hip hop culture, highlighting the degree to which crack cocaine-although a drug long in decline-has come to represent the entire paradoxical predicament of punishment in the U.S. today.